These full size binoculars have the pretty standard 10x42 binocular configuration which is a formula that just works: 42mm diameter objective lenses that are large enough to let in plenty of light, but not so large as to make them too bulky to carry. A 10x magnification that is powerful enough for most uses, but not soo powerful that you need to use a tripod to prevent image judder. The 10x magnification is ideal for most wildlife observaion, including some types of hunting as well as most general uses and birdwatching, but it does mean that compared to 8x binoculars they have a slightly reduced field of view and for this reason if you plan on using your binoculars primarily as birdwatching binoculars, you may consider getting the Nikon EDG 8x42 instead. The EDG range of binoculars and spotting scopes from Nikon get their name from their ED Glass: This 'extra-low dispersion' glass is said to effectively compensate for chromatic aberrations to provide images of superior contrast and outstanding resolution! What this really means is that the glass is of a very high density and reduces the scatter and separation of the different wavelengths of light so that they all arrive at the same time on the same focal point. This helps to reduce the color fringes that are called chromatic aberration and results in a sharper clearer image. ED glass often found on high end spotting scopes and camera lenses and is something that Nikon have taken from their Cameras. The prisms on these EDG binoculars have a Phase-correction coating that basically helps to reduce the phase shift of light that is caused by phase differences arising from total light reflection on a roof surface. This Phase-correction coating thus reduces the loss of image resolution maintaining high-contrast images and is found on most high end roof prism binoculars. Nikon also use dielectric high-reflective multilayer coatings on the roof prism, rather than the aluminium coatings used on cheaper binoculars that have a reflectivity of 87% to 93%. The dielectric coating causes the prism surfaces to act as a dielectric mirror and boosts the light reflectivity to more than 99% for the full visible range, giving you clearer whites and a sharper, brighter, more natural vision across the entire field of view. 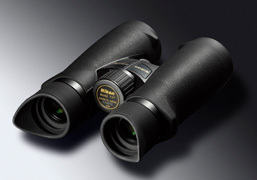 Nikon EDG binoculars also use field flattener lenses that minimize curvature of the field. These are aberrations that occur when focusing on the centre of the field of view causing the edges to go out of focus or the centre to go out of focus when focusing on the edges. The result is that they produce sharper, clearer images all the way to the lens periphery and are used in most high end binoculars these days. On top of this multilayer coatings are applied to all lenses and prisms to increase light transmission and to reduce flare and ghosting for super-bright, razor-sharp images, even at dawn and dusk. It was announced in March 2010 by Nikon that they were bringing out their new range of EDG binoculars. The biggest difference between the latest versions is in their appearance, with the new version only having one bridge between the two barrels, where previously there were two. This new single short bridge design is comfortable to hold and the binoculars feel well balanced. They are fairly leightweight, but not so light as to make them feel like they are made of plastic, and infact the body is made from die-cast magnesium. The nitrogen-filled body and O-ring seals mean that the Nikon 10x42 EDG binocular is both Waterproof (up to 5 m/16.4 ft. for 10 minutes) and fogproof. As with many top-end binoculars these days, the EDG range feature a central dual focus knob that you pull out to adjust the diopter setting. This works well and quick accurate fine focusing was no problem. Whilst they may not be the most exciting part of a pair of optics, the Eye cups can either make or break a pair of binoculars in my opinion as this is the actual point of contact between you and yourbinoculars. Some people like solid ones, whilst others like me like soft rubber eyecups. The Ergonomically designed horn-shaped eyecups on all the Nikon EDG binoculars are fantastic as they are comfortable on your face and do an excellent job of blocking out peripheral light that can be so annoying and if you don't like them they are detachable, so everyone is happy. Under these you find the main more solid rubber eyecups that can "Turn-and-slide" making it simple to position your eyes at the correct eyepoint. For non-eyeglass wearers, you just use the eyecups in the extended position. For people who wear glasses you can just use them fully retracted or the eyecups can be adjusted to any of four click stops with a maximum of 18mm of eye relief, making these true long eye relief binoculars. Below is a table comparing what I believe to be the market leader, the Swarovski 10x42 EL Binoculars and the Nikon 10x42 EDG's. I have also included the more compact 10x32 Nikon EDG as an alternative. 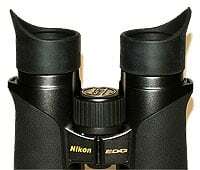 The comparison between the 10x42 Swarovski EL and the Nikon 10x42 EDG show that both binoculars are very evenly matched. The EDG has more eye relief and they are cheaper (about $400 to $500 cheeper than the EL's) where as the Swarovski's have a far shorter close focusing distance, an important consideration to anyone who often observes things like butterflies and insects. Compared to other top of the range binoculars, I would say that the Nikon EDG 10x42 binoculars are priced pretty well. If you take this into account with their excellent, class equalling but not class beating optical performance and their quality construction with all the features you would expect to find in high end optics, I would say that they make excellent value for money. 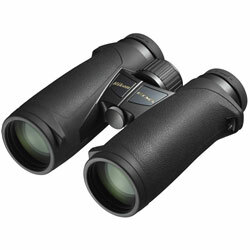 Overall they are highly recommended, making great wildlife observation, general purpose outdoor and good birding binoculars.